The use of WiFi for location determination has the advantage that no transmitters or receivers have to be installed in the building like in the case of infrared and ultrasonic based location systems. In particular the comfortable and mobile access to the internet were here the driving factors. Access points can nowadays be found in our daily environment, e.g. in many office buildings, public spaces and in urban areas. Parallel to this development there is meanwhile substantial interest in offering the user information which refers to the current location of the user (so-called Location Based Services LBS). Such Location Based Services, however, will be accepted by the user only if the cost performance ratio is satisfactory. If existing infrastructure such as WiFi without additional hardware installation can be used for location determination, then the realization costs are small and the service can be offered under attractive conditions. Several systems are nowadays available for location determination using WiFi signals. Their major application is the location determination of persons and objects inside buildings. A common approach for the localization of a terminal or mobile device by means of WiFi is based on measurements of received signal strengths of the WiFi signals from the surrounding access points at the terminal. This information is available due to the beacon broadcast multiple times a second by every access points. An estimate of the systemslocation of the terminal is then obtained on the basis of these measurements and a signal propagation model inside the building. The propagation model can be obtained using simulations or with prior calibration measurements at certain locations. In the second case, the measured signal strengths values at a certain location in the building are compared with the signal strengths values of calibrated points stored in a database. The calculation of the location of a user takes place in two phases: an offline and an online phase. During the offline phase, which has to be executed only once for each building, a so-called radiomap will be composed. This radiomap can be considered to be a collection of calibration points at different locations in the building, each with a list of radio signal strength indicator (RSSI) values for visible access points at that particular location. This process is also known as fingerprinting. During the online phase, the calibration points are being used to calculate the most probable location of the user, whose actual location is unknown. As mentioned before, the offline phase can be seen as a calibration. A certain amount of locations will be chosen, depending on the size and layout of the building. At each of these locations, a number of calibration measurements will be performed. This is due to the fact that the orientation of the user affects the RSSI value measured by the WiFi device. For example, if the user’s physical location is between the access point and the mobile device, the measured signal strength will probably be smaller compared to the situation where the user positions itself on the opposite side of the device. This is due to the fact that the signal is attenuated by the human body. The difference between two orientations has been reported to be as much as 5 dB (Bahl and Padmanabhan, 2000; Ladd et al, 2002). Therefore four different orientations are usually performed on each calibrated point (see Retscher et al., 2006). The goal of a single measurement is to determine the received signal strength of every visible access point at this location with this orientation. Due to the fact that the received signal strength is being influenced by many factors, a number of sequential measurements will be taken in order to collect statistically more reliable information on what average signal strength can be expected. Every measurement consists of a list of visible access points. For each access point, the received signal strength is measured. 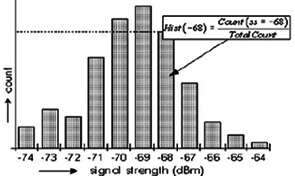 Once the measurements have been performed, a histogram is made with the measured data (see Figure 1). Each access point yields a separate histogram. These histograms are stored in the system database. The online phase is the phase where the calculation software periodically receives measurements from one or more mobile devices of different users. This information is compared against the values obtained from the offline phase, which yields a calculated position for each device. Once the received measurement has been parsed and found to be correct, it will be used as input for the calculation algorithm.